Spur Corporation’s eight brands include Spur Steak Ranches, Spur Grill & Go, Panarottis Pizza Pasta, John Dory’s Fish Grill Sushi, RocoMamas, The Hussar Grill, Casa Bella and Nikos Coalgrill Greek. Spur Group has franchisees trading through over 600 outlets across South Africa, the rest of Africa, Mauritius, Australasia and the Middle East. The group also directly owns and runs 5 restaurants in South Africa (“retail” restaurants). 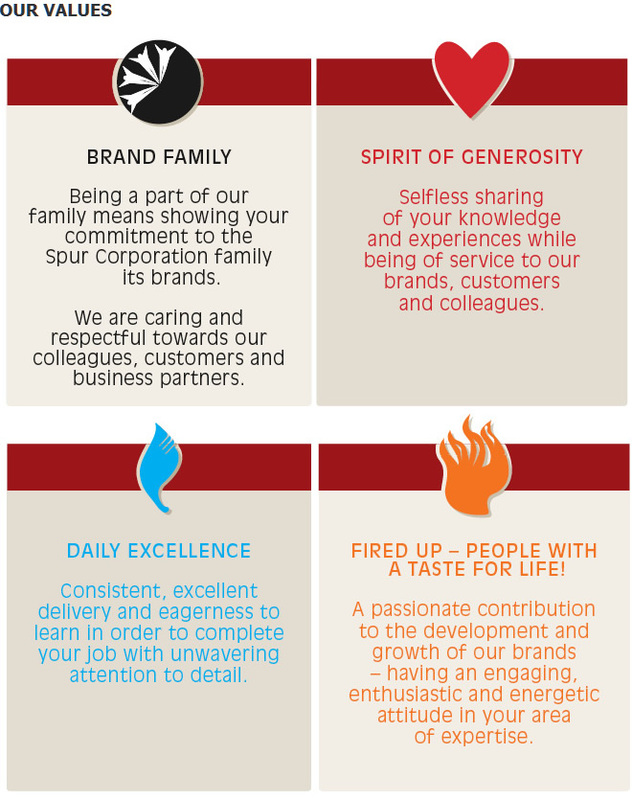 Spur Corporation also operates a sauce manufacturing facility and manages central procurement for South African franchise outlets. Our business exists to provide fun, memorable experiences over great food for the young and old. Our restaurants provide a warm, family-friendly environment with a social atmosphere that allows customers of all ages to relax and enjoy our generous, value-for-money portions of great tasting food, all served with a smile! When you meet at your “home away from home” you are treated as family. Our greatest reward is presenting our delicious meals to our families and friends. We never hold back on our generosity, our deliciously prepared food, our laughter, or our welcome. We go big on quantity, aroma and especially on taste.